KVR Price: $132.50; Save $66.50! Hollywood Strings is a collection of orchestral string instruments with "unprecedented" control over sound and performance. Recording for Hollywood Strings took place at EastWest Studio 1, the same studio where many Hollywood soundtracks and television themes were recorded with a live orchestra. Heading this project were co-producers Doug Rogers, Nick Phoenix and Thomas Bergersen and sound engineer Shawn Murphy. Joining Rogers and Phoenix as co-producer on Hollywood Strings is Thomas Bergersen, a composer and orchestrator and Phoenix's partner in trailer music company Two Steps From Hell. His extensive experience in composing for orchestras and with virtual orchestras made him a perfect fit for the team of Rogers and Phoenix. Shawn Murphy, is an Academy Award, C.A.S. (Cinema Audio Society), BAFTA, and Emmy award-winning sound engineer who has recorded and mixed the scores for more than 300 feature films including ET: the Extra-Terrestrial, Indiana Jones and the Temple of Doom, Star Wars, Jurassic Park, all five Harry Potter films, Titanic, The Curious Case of Benjamin Button, The Bourne Ultimatum, Minority Report, Saving Private Ryan, Munich, The Passion Of The Christ, X-Men: The Last Stand, Memoirs of a Geisha and Ice Age. 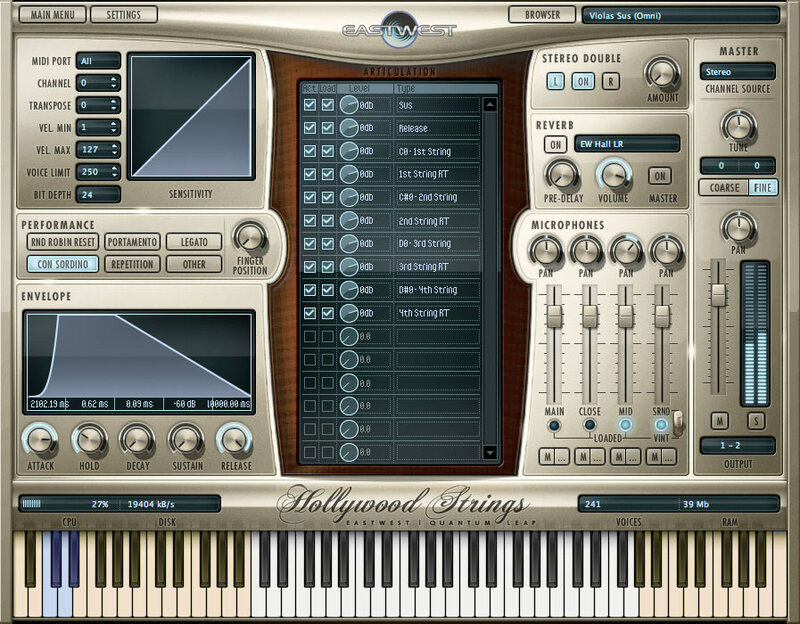 According to EastWest, Hollywood Strings has many groundbreaking features not found in any other virtual strings collection. Finger position is, for the first time, controllable by the user, so they can play as far up the strings as they want, and get a fuller, more romantic, Hollywood sound. Vibrato intensity and extensive dynamics are controllable by the user. Extensive multi-dynamic true legato has been sampled for all sections in three different categories: slurred, portamento, and bow change. This results in unsurpassed legato performance that has never been available in the sample world, says EastWest. Hollywood Strings has five user-controllable microphone positions including main pickup (Decca tree), mid pickup, close pickup, surround pickup, and an alternate vintage circa 1945 RCA ribbon room pickup. Multiple finger positions for all sections including open strings. 3 unique styles of legato interval sampling, including never before sampled bow change legato, slurred legato, and portamento sliding legato, sampled at 3, 3 and 2 dynamics respectively, all with speed control. 5 dynamics of up- and down-bowed sustains. 16 1st Violins (9/7 divisi mode). 14 2nd Violins (8/6 divisi mode). 10 Violas (6/4 divisi mode). 10 Cellos (6/4 divisi mode). 7 Basses (4/3 divisi mode). Recorded in the famous EastWest Studios 1. Main - Decca tree (Neumann M50s) and Brauner VM1 KHE (Klaus Heyne Edition) outriggers. Mid - Neumann KMi, Neumann KM 254, Sony C37A, Neumann U-47. Close - AKG C12, Neumann U47, Neumann U67, Nordic Audio Labs NU-47. Surround - Neumann KM 83. Alternate Room - Vintage RCA44 Ribbon. Hollywood Strings Gold Edition is 16-bit, with one mic position (mid-tree, no divisi) and all articulations except bow change legato. Upgrades to the Hollywood Strings Diamond Edition will be effortless as all articulations are included in the Gold Edition, and can be done at any time. The Gold Edition is available for purchase via download, and available in DVD format. Hollywood Strings Silver Edition is 16-bit, with one mic position (mid-tree, no divisi), and includes an essential set of articulations and instruments with slur legato. Upgrade to Hollywood Strings Gold and Diamond Edition when you need more options. Hollywood Strings Silver Edition is available for download only.